Many folks look forward to the fall after a long, hot summer. The trees start changing colors, the leaves begin to fall, and the weather becomes much cooler. However, falling leaves can clog up your gutters. This can lead to leaks in your home, water damage, and other problems. 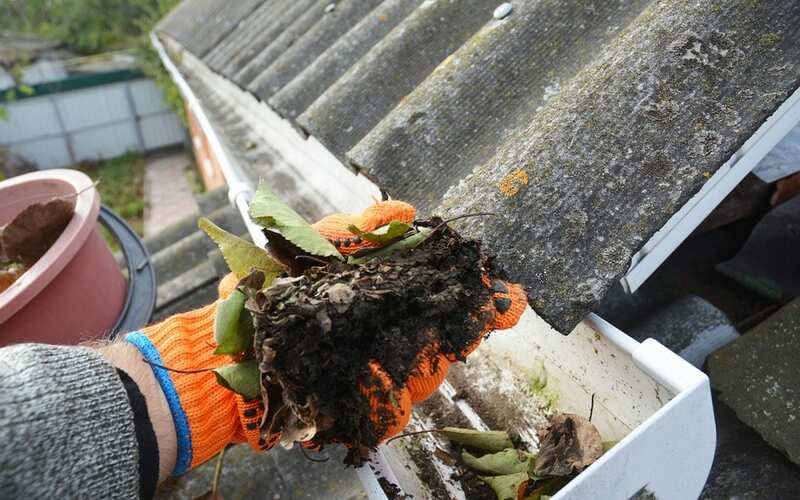 Here are 5 steps for successfully cleaning out your gutters. 1. Get together all your equipment. You will need a ladder so you can get up to the level of the gutters. Make sure you are using the ladder on stable ground and make sure someone else is at home while you are using it. Also, grab some gloves and a trowel to scoop the gutters. Place a tarp down below to collect the debris you toss down from the gutters so you can haul it away later. 2. When you are up on the ladder, evaluate the condition of the gutters. Make sure your gutters are not sagging because this will cause the water to pool in the gutter instead of flowing out. If the seams between sections are coming apart, apply caulk on both sides of the seams. If you discover small holes while cleaning out your gutters, roofing cement can be used to repair them, but in some cases, it is better to replace the whole section of gutter. 3. When you are at the level of the gutter, use a gloved hand and the trowel to remove any debris, dirt, leaves, and twigs that might be inside them. Try to aim all the debris for the tarp below so it doesn’t dirty up your landscaping. As you move the ladder to reach a different section, bring the tarp along with it. After you have cleared the gutters, use a hose or a power washer and force all the remaining debris down the gutter and out the spout. 4. You may want to invest in gutter guards. While gutter guards keep debris out of the gutter, you may still need to wash debris off the top of the gutter guards. Dirt will still wind up in your gutters over time, but gutter guards will reduce how often you need to clean the inside channel. There are several types of gutter guards on the market. Do your research to determine which system might be best for you. 5. Make sure you flush all the debris out of the downspout. Not cleaning this out will cause water to back up and your gutters will not work properly to divert water away from your home. It is important to clean out your gutters so that water coming off your roof is redirected properly. This helps eliminate water leaking into your roof or your windows. Gutters can get clogged with leaves, branches, and even materials from your roof. They can even create a home for pests and insects. When they get clogged, the water cannot drain out of them properly. This can lead to property damage and costly repairs. Fall is a great time to get your home in shape. This includes cleaning out your gutters so they can effectively do their job during fall and winter, so take the time to maintain them now. Home Inspectors of Middle Tennessee serves Greater Nashville and the surrounding areas with home inspection services. Contact us to book your appointment.